VOA's Myroslava Gongadze speaks with Ukrainian President Petro Poroshenko in Kyiv, Ukraine, September 4, 2015. Ukrainian President Petro Poroshenko said Friday that Russia should be stripped of its veto power in the United Nations Security Council because of its aggressive actions in the country’s volatile east. The embattled leader, in an exclusive VOA interview, said Russia should remain a Security Council member because it is a leading military power, but insisted the global community would be safer if Russia’s ability to play U.N. spoiler were put to an end. 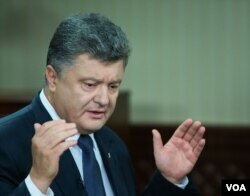 “I think their veto right should be lifted,” said Poroshenko. Ukrainian President Petro Poroshenko in Kyiv, Ukraine, September 4, 2015. He pointed to Russia’s rejection last month of a Security Council resolution to create an international criminal tribunal to investigate the July 2014 downing of Malaysia Airlines Flight MH17 over eastern Ukraine that killed 298 people. “The world has a right to know who’s responsible for this disastrous terrorist attack,” Poroshenko said. “But, unfortunately, if only one country, especially Russia as a permanent U.N. Security Council member, uses its veto right – this is self-explanatory,” he said. Ukraine and other countries say Russian-backed militants were operating in the area from which the fatal missile was fired, while the rebels have said Ukrainian forces were responsible. VOA's Myroslava Gongadze in Kyiv, Ukraine, September 4, 2015. Poroshenko’s comments come in the run-up to the 70th U.N. General Assembly meetings in New York later this month. Russian President Vladimir Putin is scheduled to address the world body for the first time in 10 years on Sept. 28 – just one day before Poroshenko himself is slated to speak. Earlier this week, Ukraine's national security council approved a revised military doctrine that declares Russia to be a military opponent and calls for the country to pursue NATO membership. The doctrine reverses Russia’s previous friendly status and recognizes the high probability of full-scale military force being applied against Ukraine. It now goes to Poroshenko for his signature. There was no immediate official reaction from Russia, which denies claims it has sent troops and equipment to rebels in Ukraine's secessionist eastern districts and which opposes Ukraine joining NATO. Poroshenko, squeezed by a Russia-backed war in the Donetsk and Luhansk regions and hardline nationalists opposed to granting any autonomy to rebel-held areas, told VOA international support for Ukraine is in the West’s own interest. Meanwhile, the country’s pro-Western president is dealing with a political firestorm at home. Three members of Ukraine’s National Guard were killed and about 130 wounded when deadly protests broke out in the capital, Kyiv, earlier this week over Poroshenko’s proposal to amend Ukraine’s constitution and grant increased autonomy to local governments. 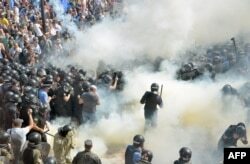 FILE - Smoke rises near the parliament building in Kiev as activists of radical Ukrainian parties, including the Ukrainian nationalist party Svoboda (Freedom), clash with police officers on August 31, 2015. The hotly contested decentralization measure, which was initially ratified Monday, requires final approval from a parliamentary supermajority of 300 votes and the passage of a separate law. Changing the status of rebel regions in the east was demanded by Russian President Putin in the Minsk peace talks last winter and is supported by the U.S. and European Union. But Ukrainian nationalists and others are furious at the possibility that elected pro-Russian separatists could eventually enter Ukraine’s parliament or wield local power. Opponents of Poroshenko are also using the issue against him in the campaign for local elections at the end of October. Poroshenko appeared unfazed during the interview, saying the reforms were necessary to keep the country’s east and implement the cease-fire accords. “A constitutional change is exactly what Ukraine needs. We are taking steps that allow for the return of the occupied territories,” the president said. 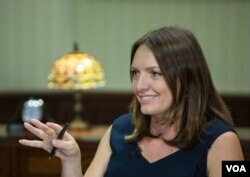 Myroslava Gongadze conducted this interview in Kyiv; Mark Snowiss contributed from Washington.